Electrical Discharge Machining (EDM) is a metal removal process accomplished by the creation of thousands of electrical discharges per second that flow between an electrode and the workpiece in a dielectric fluid. It has the effect of vaporizing the metal in a very small controlled area. The EDM process can be used on any material that is electrically conductive, including exotic materials such as Waspaloy or Hastaloy, which are very difficult to machine using conventional methods. There are two major types of EDM, Wire EDM and Sinker EDM (sometimes called Ram or Conventional EDM). Sinker EDM is the older of the two. 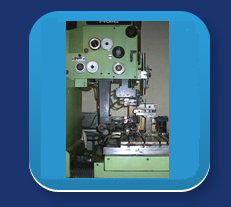 Although the EDM principle was discovered during the early 1940s, it was not until the early 1950s that the first practical Sinker EDM machine was designed. Wire EDM was introduced as a machining process in 1969. The main difference between the two is the type of electrode used. Wire EDM, as its name suggests, uses wire as the electrode. The wire burns a predetermined contour through the part leaving a path of 0.001" to 0.003" larger than the wire diameter. The wire diameter ranges from 0.0005" to 0.0130". Brass is the most common wire used along with zinc-coated wire. Smaller wires are generally made of molybdenum or tungsten. Sinker EDM, as its name suggests, sinks the shape that is on the electrode part way into the workpiece. The common types of electrode materials used are graphite (for ease of machining and wearability) and copper tungsten (for fine finish requirements).